I could eat it all day... all the time! So ... what is hummus? 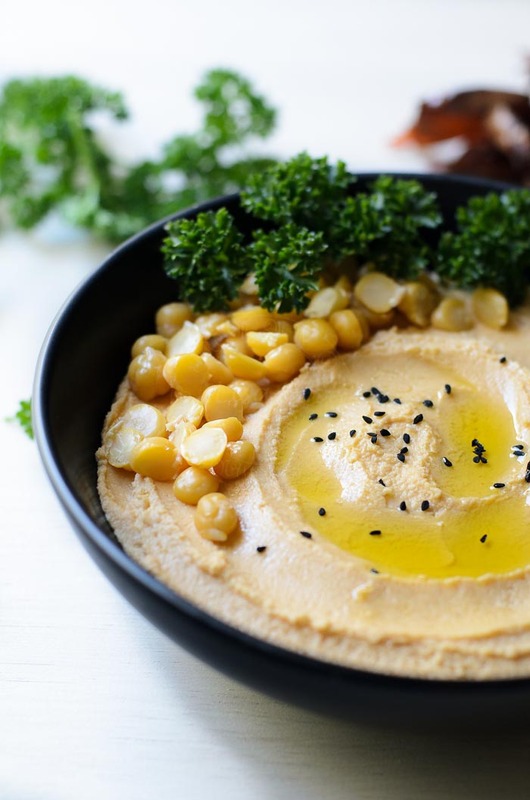 Hummus (/ˈhʊ.məs/, /ˈxʊ.mʊs/, or /ˈhʌ.məs/; Arabic: حُمُّص‎‎ Hebrew: חומוס‎‎, full Arabic name: hummus bi tahini) is a Levantine and Egyptian food dip or spread made from cooked, mashed chickpeas or other beans, blended with tahini, olive oil, lemon juice, salt and garlic. Today, it is popular throughout the Middle East (including Turkey), North Africa (including Morocco), and in Middle Eastern cuisine around the globe. It can be found in most grocery stores in North America. I love chickpeas! Give me chickpeas, in any form, any time, any day... I will never say "NO"
I grew up snacking on chickpeas. Mom would popped, 1/2 kg or more dried chickpeas, into her monthly grocery shopping bag. Then she would soaked the chickpea overnight, letting it soften before boiling with salt water. Once ready, we would be munching on chickpeas as our snack for the day! If I chanced upon a street vendor selling soft boiled peanuts in pods, and he had chickpeas too, I'd go for chickpeas rather than peanuts (even though I do love that soft boiled peanuts in its pods). until I was in the UK. Hummus were sold in the deli section then. On my way back from college, I'd drop by Safeway to buy dinner (usually sandwiches or fruits or yoghurt at marked down price... I was a student living in a big city on a shoe-string budget!! No parents to fuss over me, no mom's home cooked dinner, no extra money to splurge on fancy meal). One tub was golden yellow creamy looking paste, while the other was pinkish in colour... trying to work out what is what! Information was pretty much depending on the person behind the deli counter. Even the word 'Internet' was unheard of! But... I again cheated... I didn't use tahini. I was in opine that it'll be a waste to buy a bottle of tahini when I needed so little... hence I use roasted sesame and blend with chickpeas till smooth. Homemade hummus with sweet potato mash. Washed and soaked chickpea overnight. Boil chickpea until soft. (Alternative buy the canned chickpeas). Place all ingredients in food processor and processed until smooth. Serve with crispy sweet potato skins or crackers. I too can eat hummus any time..can even eat them as the main :-)) Love the add of sweet potatoes here, Lisa. Please could you provide measurement conversions for American cooking. This recipe looks really yummy...! !